September is National Yoga Month and a wonderful travel month. It’s the perfect time to take your daily yoga practice to a new, beautiful location. From yoga overlooking the most spectacular views on a ranch in Montana to morning yoga/ meditation in London, check out these six best places to stay for National Yoga Month in September. Located atop a dramatic bluff with sweeping views of the Caribbean Sea and Charlotte Amalie Harbor, Frenchman’s Reef is the premier resort in St. Thomas. Offering loads of adventure and wellness, guests can practice SUP yoga in the Charlotte Amalie Harbor (rates $39 per person; courtesy of the on property Adventure Center) or yoga in the mornings at the private spa pool. 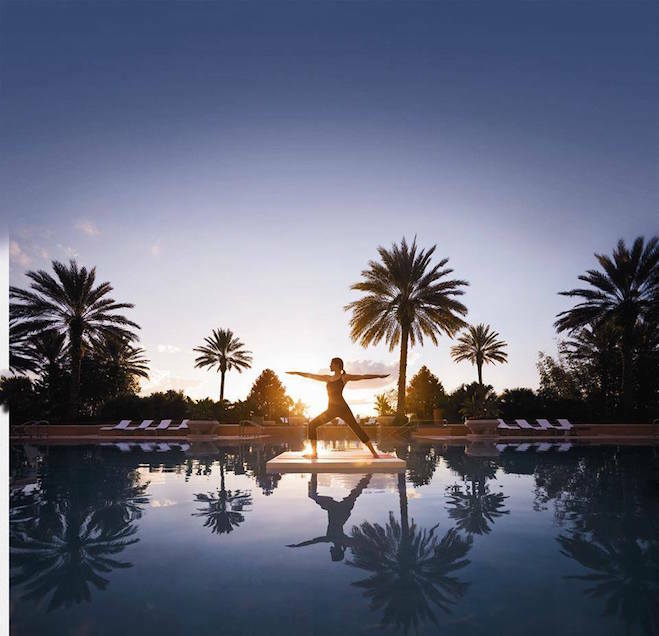 The award-winning 40,000 square foot Ritz-Carlton Spa Orlando is offering spa-goers the opportunity to have a relaxing workout while cooling down from the Florida heat. 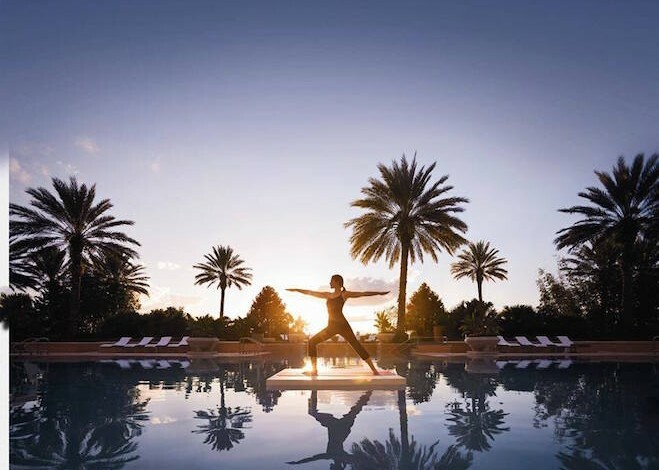 Liquid Yoga classes are offered in the spa’s 4,000-square-foot outdoor pool and available weekly. Classes are led by trained yoga instructors to lead class participants in performing signature yoga moves while submerged in water. This class continues to spa’s philosophy of sanitas per agua, “health through water,” and is set in a relaxing environment surrounded by lush gardens, a peaceful lake and Spanish-Moorish architecture. September is an amazing time to visit The Resort at Paws Up with its sunny days, crisp nights and an array of wellness offerings including yoga classes offered at Spa Town in the meadow or a SUP yoga class on the lake. A brief massage is given during Shavasana. Need we say more? Get your namaste on and culinary fix at Montana Master Chefs: James Beard All-Stars on September 29–October 2, 2016. Paws Up has invited acclaimed chefs recognized by the James Beard Foundation to work their magic. From haute cuisine to iconic classics, guests will enjoy all the world-class dining and libations that these acclaimed chefs and guest vintners have to offer. October is also a must-stay month at Paws up. On October 7th-10th, spend the weekend getting your hands doughy at Upper Crust, a one-of-a-kind kitchen adventure in Montana, which offers more than flour and sugar—yoga classes, glamping, spa treatments, cattle drives and live music are also on the menu. Located in the heart of Oregon’s wine country, the 85-room luxury boutique resort offers Sunday morning outdoor yoga in the resort’s lush Meadow Garden. Guests can take Hatha, Yin, and Vinyasa to start their day feeling replenished and revitalized. For those looking for more intimate surroundings, The Allison offers private yoga sessions in the Sky Suite, an exclusive spa haven dedicated to small groups and gatherings. After yoga and massage, guests are welcome to re-energize with chilled quinoa salad and antioxidant smoothies on the spa’s light fare menu and enjoy the eucalyptus-infused steam room, dry sauna, and lounge rooms complete with complimentary warm neck wraps, healthy snacks and hot tea service. The Allison Spa has 15,000 sq. ft. dedicated to health and wellness, with 12 treatment rooms, a fitness center, pool and jacuzzi. Treat yourself to one of London’s largest and most exclusive spa’s with Bulgari Hotel, London’s urban wellness retreat. Take advantage of the impressive facilities, world class specialists and master therapists that have made this spa a destination for travelers around the world. After the gym’s comprehensive Framework assessment, guests will be invited to customize the program to their needs – including morning yoga and meditation classes, signature spa treatments and a healthy eating plan including dishes from Rivea, the hotel’s award-winning Alain Ducasse restaurant. 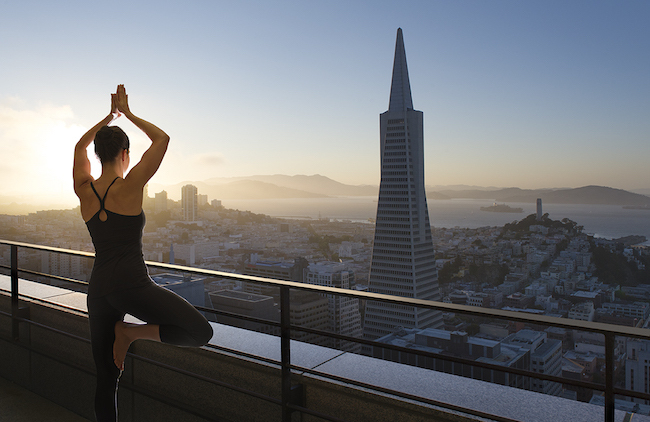 Enjoy weekly yoga sessions on the stunning 40th-floor Sky Deck of Loews Regency San Francisco. Created in partnership with Wheel House, one of San Francisco’s most innovate yoga studios, Sky Deck Yoga revitalizes minds and bodies high above the City by the Bay surrounded by stunning views of the Golden Gate Bridge, Coit Tower, Transamerica Pyramid and Alcatraz Island. The incredibly personalized, 75-minute offering is open to just 20 participants per class, with two sessions taking place simultaneously on either side of the Sky Deck. Sky Deck Yoga offered at 9am every Saturday at Loews Regency San Francisco; $30 per participant. The Allison Inn and Paws Up have been on my list for quite some time.